The Porsche Design Automatic 6351.43.44.1254 Watch is a display type analog watch, with a sandblasted circular brushed PVD coated stainless steel case, and a black rubber strap. It has a black and orange dial on a round-shaped face. The Porsche Design 6351.43.44.1254 Men's Watch has Swiss automatic self-winding movement, Sellita Calibre SW200-1, and Porsche Design rotor. The Flat Six Automatic also features a scratch resistant sapphire crystal face to protect the dial. 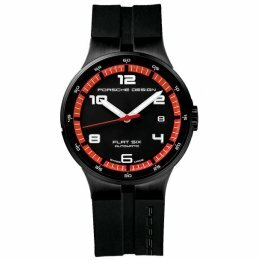 The Porsche Design 6620.11.66.0268 Dashboard Watch is fitted with a Titanum-covered black rubber strap by Porsche Design. It has a Tachymeter Scale, silver-tones hand indicators and black arabic numeral markers. The Porsche Design Chronograph 6620 watch has scratch resistant sapphire crystal to protect the dial, Swiss Self-Winding movement, 27 Jewels and is 100 Metres Water resistant.